Barkley was a rescued Great Pyrenees who underwent treatment for bone cancer at the University of Missouri Veterinary Health Center (VHC). When he fell ill, his owner would drive him more than two hours each way every time he received radiation treatments. However, when she broke her ankle, she could no longer make the drive. Barkley’s case was the inspiration behind College of Veterinary Medicine Dean Carolyn J. Henry’s vision for a guesthouse at the VHC where clients could stay with their pets. If Barkley House had existed for its namesake, the long commutes and transportation dilemma would have been eliminated, and Barkley and his owner could have lodged together during his treatments. 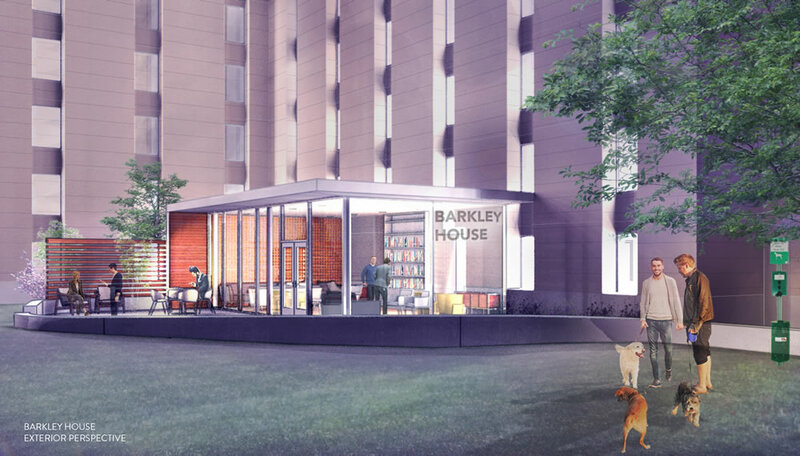 Barkley House is a unique concept to provide affordable temporary lodging for families whose pets are receiving treatment at the VHC. Many times the cost of lodging or time needed for travel to and from a distant medical facility is a strong factor in determining if an animal receives life-saving medical care. Barkley House will increase the opportunity for families to seek specialized treatment for their pets. Allowing pets to remain with their families also helps speed their recovery and lessen anxiety during treatment on both ends of the leash. A dedicated facility for clients who may face difficult and emotional decisions about their pets’ medical conditions, will create opportunities for them to share the camaraderie of others also facing stressful pet health challenges. While the CVM currently has two Barkley House rooms at Stoney Creek Hotel and Conference Center, we are ready to take the next step as we move forward. We plan to renovate a first-floor wing of an older dormitory located across the street from the VHC. The facility has been designed to enhance interaction and support between clients, their seriously ill pets and veterinary medical staff and students. It will include five guest suites, a family room, a laundry facility and an office. Barkley House has been designed to provide an animal-friendly, home-like environment. The facility will provide clients with a work space, Internet access, and kitchenettes to allow for special dietary needs ─ both human and animal. In addition to funds already secured, $1.8 million is needed to pursue this endeavor. This guest house will be the first of its kind, and we hope, with your support, it will become the model where veterinary patients and their families can come, stay, and heal.